This exam uses low-dose x-rays to make a picture of breast tissue. The picture is called a mammogram. Most medical organizations in the United States and Canada advise regular screening. There are some differences among these groups about when to start and how often to have the screenings. The United States Preventive Services Task Force (USPSTF) advises that women aged 50 to 74 years old get the test every two years. Other organizations advise screening every year starting at age 40. Women who are at high risk for breast cancer may need to have the tests starting at an earlier age and more often. Talk to your doctor about what is best for you. Problems from the test are rare, but all procedures have some risk. Mammograms use low dose radiation and can cause brief pain in the breasts. The test may not be advised if you are pregnant. If you are planning to have this test, your doctor will go over potential problems with you. Scheduling the exam when breast tissue is least tender. This is most often a week after your period. Use exactly as advised by your doctor. Do not use more than advised. Don't use over broken/cut skin or irritated skin. Don't wrap the area after you put on the medicine. Have breast implants —The facility may use special techniques for implants. Do not use deodorant, talcum powder, lotion, or perfume near your breasts or under your arms. Wear loose clothing so you can easily remove your shirt. Bring copies of previous mammograms and reports with you. If you have them done in the same place each time, they will have results from prior years. The doctor can compare the old images to the new ones. Describe any breast problems to the technician before the exam. You will stand in front of a special x-ray machine. It has a platform to place your breast on. The technician will adjust the height of the platform. One breast will be lifted and placed between special plates that hold film. The plate is brought close to the platform and compresses the breast. The exam will cause some discomfort. Tell the technician if you feel any pain. At least two pictures of each breast are taken. For one picture, you face toward the platform and the image is taken looking down at the breast. For a second picture, you stand beside the machine for a side view. Extra images may be needed if you have implants. Your doctor may also need more images if this test is being used to help make a diagnosis. You will wait in the facility until the x-rays are developed. More images may be needed. You can go home after the exam. You may feel some discomfort and pain. The radiologist will look at the images and may speak with you at the end of the exam. You will usually get your results within seven days. If you do not, call and ask for the results. If the results are normal, you will need your next exam in one to two years. The test can sometimes find things that look like cancer, but are not. If something is noticed on the test, you may need to have other tests done, like an ultrasound or a breast biopsy. This will help find out if there is a real problem or if all is fine. Also, like all screening tests, the test will not detect every single abnormality. Mammograms. National Cancer Institute website. Available at: http://www.cancer.gov/cancertopics/factsheet/detection/mammograms. Updated December 7, 2016. Accessed July 24, 2018. Mammography (breast imaging). Radiological Society of North America Radiology Info website. Available at: http://www.radiologyinfo.org/en/info.cfm?pg=mammo. Accessed February 3, 2017. Accessed July 24, 2018. 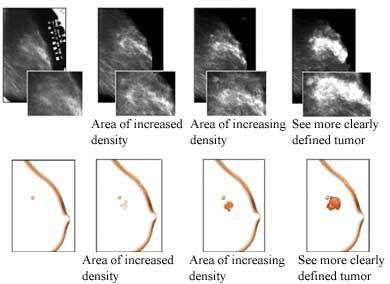 Mammography for breast cancer screening. EBSCO DynaMed Plus website. Available at: http://www.dynamed.com/topics/dmp~AN~T115728/Mammography-for-breast-cancer-screening . Updated September 20, 2017. Accessed July 24, 2018. 8/12/2011 DynaMed Plus Systematic Literature Surveillance http://www.dynamed.com/topics/dmp~AN~T115728/Mammography-for-breast-cancer-screening : The American Congress of Obstetricians and Gynecologists. Practice bulletin no.122: Breast cancer screening. Obstet Gynecol. 2011;118(2 Pt 1):372-382. Reaffirmed 2014.